Quantitation of aggregate is a critical quality attribute in biopharmaceutical development. The determination of monomer, dimer, and multimer, as well as higher order structure (quaternary structural determination of a mAb), and high/low molecular weight species are commonly observed through size exclusion chromatography. The average drug-to-antibody ratio (DAR) is critical to assess in the development of antibody-drug conjugates (ADCs). Though different chromatography modes can be employed to determine DAR, a highly effective method utilized reversed phase chromatography. Glycosylation of proteins-specifically monoclonal antibodies-have indications on protein structure and is arguably the most critical post-translational modification to characterize in biopharmaceutical development. N-glycan analysis through hydrophilic interaction chromatography (HILIC) is a robust method for absolute quantitation of glycoforms and is the gold standard for glycosylation characterization. Intact mass analysis involves using high resolution accurate mass (HRAM) instrumentation to confirm protein sequence and identify post-translational modifications. Often in combination with reversed phase chromatography, intact mass analysis is utilized on native proteins, mAbs, and ADCs in biopharmaceutical development. Observation of intact protein and fragmented protein during impurity profiling is essential in biologic development. Utilizing reversed phase chromatography on native protein and partially fragmented protein scientists can observe characteristics including heavy chain/light chain, Fc/Fab, or isoforms. For protein characterization, peptide mapping is commonly used for identification of non-enzymatic, spontaneous post translational modifications, such as deamidation, oxidation, succinimide formation, pyroglutamate formation, and others. Reversed phase chromatography is used for confirming primary sequence, but is more commonly for PTM identification. The determination of signature peptide concentration from biological matrices using LC-MS. Scientists utilize peptide quantitation to deconvolute complex chromatograms by searching for specific peptide sequences, which can analyze the peptides with high sensitivity and specificity, even at low levels of peptide. Separate MABs from from acidic/basic variants . Complex large molecules composed of amino acid polymer chains. Proteins in biopharmaceuticals typically range from 3,000-150,000 kDa. Under the biologics classification, biopharmaceutical proteins can be hormones, human growth factors, and monoclonal antibodies (mAbs). The most common biopharmaceutical proteins are insulin and mAbs. state of Zen for your mind, body, soul, and lab. 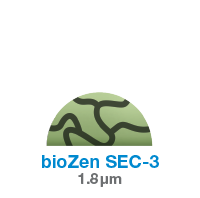 Solid phase extraction (SPE) HILIC stationary phase that excels at retention and recovery labeled released N-glycans! Microelution format allows for streamlined processing and clean-up of small sample volumes. RP, HILIC, IEX, and Size Exclusion solutions for the analysis of biologics such as mAbs and ADCs. New titanium LC hardware that improves sample recovery and minimizes the need for column priming. Extremely inert, high density fully porous particle with high efficiency and high molecular weight (HMW) separation range of 10 K – 700 kDa.